The best business talent and innovation was celebrated at a glittering Sandwell Business Awards ceremony last night. The event was hosted by ITV Central presenter Sameena Ali-Khan. Adrian Bailey, MP for West Bromwich West, was a special guest at the ceremony organised by Sandwell College, Sandwell Council and the Think Sandwell team, and the son of the late Sandwell Council leader, Cllr Darren Cooper, Matt also presented an award in his father’s honour. Industrial Power Units, Carillion, The Live & Work Project, Home to Home Calls, Kier Living, Scott Arms Dental Practice, Bordesley Village Dental Practice were all winners. 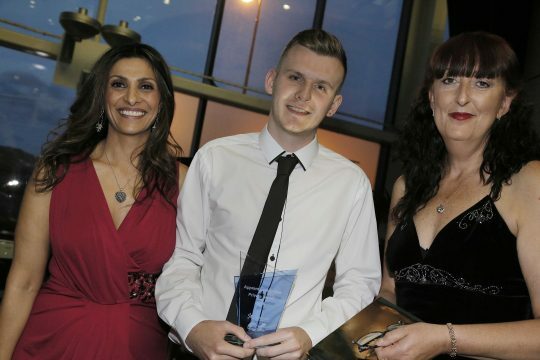 Trainee of the Year went to Sandwell College’s Aaron Bell. Apprenticeship Star Awards went to Anthony Goodall (pictured above) from the AA, and Kirsty Campbell from Sandwell Council’s Bereavement Services. The Darren Cooper Award was presented to Leah Truslove from Brandhall Primary School.